Nigeria’s oil-rich Bayelsa state started an inquiry into the human and environmental impact of spills caused by multinational businesses operating in the region, opening a potential new conflict with companies that pump the bulk of the nation’s crude. The Bayelsa State Oil and Environmental Commission is in charge of the inquiry, which will be led by the British Archbishop of York, John Sentamu. It’s the first time such an investigation will be launched by a Nigerian oil-producing state, indicating concerns about rising environmental pollution in a region that’s vital to the nation’s economy. “The Commission’s aim is for oil companies to agree to a global standard of behavior, conducting their operations in Bayelsa as they would in Norway, Scotland or the USA,” the commission said in a statement. Companies operating in Nigeria’s oil-rich Niger River delta spill about 40 million liters of oil a year, according to the commission. 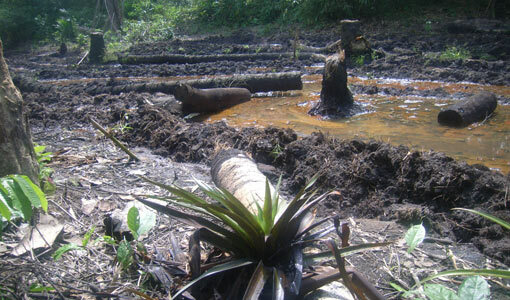 A 2011 report by the United Nations Environment Programme on oil pollution in Ogoniland in Rivers State concluded that the soils and groundwater in the community have been so contaminated by more than 50 years of oil spills that it would take up to 30 years to reverse the damage. The commission will visit oil-spill sites from March 27-29 to take testimonies from affected residents. It will publish a report of its findings later this year and make recommendations that will lead to the development of a new legal framework that ensures accountability for oil companies operating in the state. International oil companies operating in Nigeria include Royal Dutch Shell Plc, Chevron Corp., Exxon Mobil Corp. and Total SA.